Shares of Abiomed, Inc. (ABMD) rallied this morning $12.34, or 16%, to $89.74 after the company released its earnings results on Tuesday. In its quarterly report, the maker of heart devices said it earned $0.20 per share, well above the $0.07 per share analysts were expecting. Revenue rose 50.4% to $73.4 million, above views for $66.03 million. For full fiscal year 2016, Danvers, Massachusetts-based Abiomed provided revenue guidance of $300 – $310 million, compared to the consensus revenue estimate of $292.42 million. Abiomed shares have more than doubled since the beginning of the year. 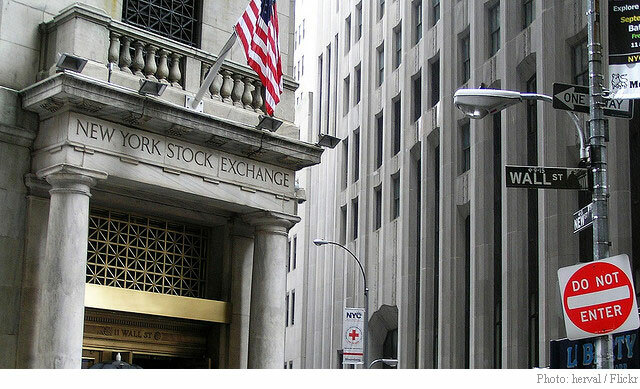 Shares of Skyworks Solutions Inc. (SWKS) are lower by nearly 6% to $87.26 in morning trading on Tuesday. The issue had an aggressive breakdown of its multi-month support along the $90-area. Some continuation below today’s lows could set it in motion for a challenge of its 200-day EMA around the $86 level. A break below this key level could portend further technical downside for the stock, which is currently trading on heavy volume with 4.8 million shares changing hand, well ahead of its three month daily average of 3.7 million shares. Shares of online retail broker E*TRADE Financial Corporation (ETFC) are up nearly 5% this morning on news of Standard & Poors raising its issuer credit and debt ratings on the company to ‘BBB-‘ from ‘BB-‘. The credit rating firm also raised its long and short-term issuer credit ratings on E*TRADE Bank. S&P assigned a stable outlook for the ratings. Shares of LendingTree, Inc. (TREE), up 39.30%, hit a new all time high on Tuesday, printing the tape at $116.95. That’s a 356.30% rise, or $91.32 per share from the 52-week low of $25.63 set in Aug. 5, 2014. The mortgage lending service provider beat Q2’15 estimates by reporting EPS of $0.63 on revenues of $55.1 million, up 30.9% from a year ago. Analysts were expecting EPS of $0.53 on revenues of $52.35 million. The company also raised Q3’15 projections, guiding the current quarter ending in September with revenues of $60-$62 million, as compared to analysts’ expectations of $51.84 million.